Summit Daily/Mark FoxThe Tenmile parcel includes portions around Quandary Peak near Breckenridge. SUMMIT COUNTY – Conservation groups hoping to expand wilderness protections to lands inside the White River National Forest are gaining traction in Summit County. Local mountain bikers and members of the fire-fighting community have grown more comfortable with the so-called Hidden Gems wilderness proposal recently, although off-road vehicle riders remain opposed to efforts to close more public lands to motorized use. The Hidden Gems Campaign, organized by four Colorado-based environmental groups, seeks to designate as wilderness 379,000 acres of National Forest and Bureau of Land Management lands in Summit, Eagle, Pitkin, Gunnison, Rio Blanco and Garfield counties. The proposal includes 46,000 acres in Summit County. During the last several months, campaign organizers have negotiated with recreators, local governments, firefighters and the Colorado Department of Transportation. Those discussions have included adjustments to proposed wilderness boundaries to accommodate activities like hunting, mountain-biking, snowmobiling, fire mitigation and watershed protection. The Wilderness Act of 1964 aims to create lands “untrammeled by man.” It allows for non-motorized recreation, livestock grazing and scientific research. Mineral development, oil and gas drilling, logging, ATVs, snowmobiles and mountain bikes are forbidden. Fire-fighting activities are allowed, but they require approvals beyond what is necessary on public lands not designated as wilderness. Part of conservationists’ motivation for the proposal is to increase the amount of wilderness land below timber line. Eagles Nest Wilderness, which includes Summit County landmarks Buffalo and Red mountains, is an example of the striking high-altitude wilderness Kunkle refers to. Many of the proposed Hidden Gems parcels would take existing wilderness boundaries and stretch them downward into forested lands. In Summit County, the Elliot Ridge and Corral Creek parcels would expand Eagles Nest Wilderness at its northern and southern boundaries, respectively. The proposed Ute Pass, Ptarmigan A and Acorn Creek parcels would enlarge Ptarmigan Peak Wilderness. Another benefit to lower-elevation designations is that they would be more accessible to people seeking wilderness experiences, Kunkle said. Fuels-reduction efforts, fire suppression and post-fire remediation are more tightly controlled in wilderness areas than they are on public lands without wilderness designation. Restrictions are especially stringent on any mechanized work, including use of chainsaws, bulldozers and aircraft. Local fire officials and town governments had expressed concerns over the original Hidden Gems proposal, worried that they might not be able to adequately protect residential developments and water supplies. So member agencies of the Summit Count Wildfire Council worked with campaign organizers to make several boundary adjustments to the proposal. The Hoosier Ridge parcel, located just east of Hoosier Pass, was tightened up a bit to allow fire mitigation and remediation activity near Goose Pasture Tarn, the Town of Breckenridge’s water supply. Hidden Gems advocates also made adjustments to parcels flanking Ptarmigan Peak Wilderness, which are near the Ptarmigan, Acorn Creek and Hamilton Creek neighborhoods. The proposed Porcupine Gulch parcel, which runs atop the Continental Divide between Loveland Pass and the Eisenhower Tunnel, was adjusted to allow for fire mitigation along Straight Creek (Dillon’s water supply) and to save room for possible future solutions to Interstate 70’s traffic woes. The motorized recreation community remains a staunch adversary to the Hidden Gems proposal. Ginsberg worried that many four-wheel-drive roads popular among ATV users in the north end of the county would be off limits under the Hidden Gems proposal. “People not physically able to hike into those areas would be ruled out of there,” he said. Hidden Gems and the local mountain-biking community have managed to forgo friction for friendship. In lieu of strict wilderness protection, “companion” designation may be proposed for some spots that include cherished single track. A companion area could flank a wilderness area and exclude motorized uses and resource extraction, but still allow mountain biking. “We figured out the critical connectors and the future connectors, and we really held the line on that stuff,” Summit Fat Tire Society’s McCormack said. “When we sat down at the table, we realized we liked those people, and to their surprise, they liked us. “I would consider us allies. It’s good to have brothers in arms against the real threats, like the extractive industries. If we succeed, we will have created a public lands protection plan that is ground-breaking,” McCormack added. 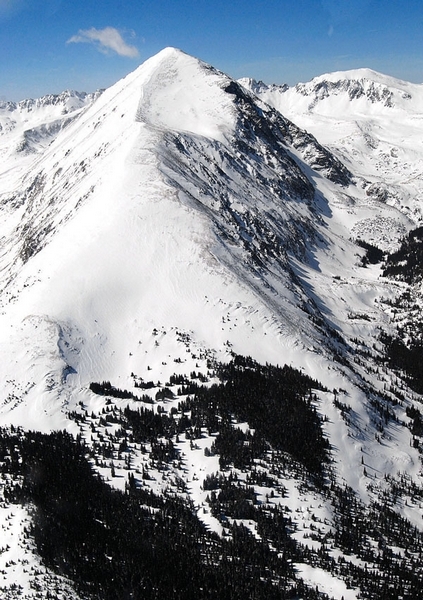 One area for which companion designation is being proposed is inside the Tenmile parcel, which includes Quandary Peak and Crystal Peak, at the southern end of Summit County. The Bem Rose Ski Circus would be part of such a designation, preserving cyclists’ connections to Park County and a high-altitude route with superior views. According to Kunkle, organizers are close to wrapping up negotiations. They hope to soon have a finalized proposal to present to Colorado’s congressional delegation, with Rep. Jared Polis a key target to carry a piece of federal legislation. “We hope he will lead the charge,” Kunkle said.